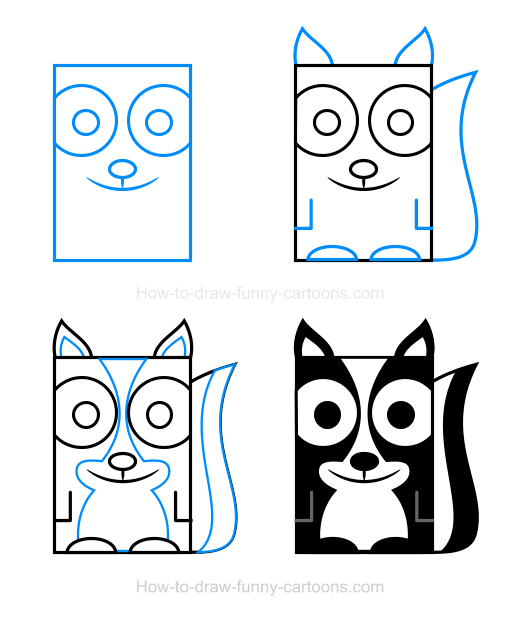 More complex than similar tutorials from the same series, this skunk clipart is still quite easy to create once you are familiar with all steps needed to illustrate this adorable cartoon character. Sure, you might need to draw a more complex pattern inside the character to complete this one, but this extra step is still accessible. 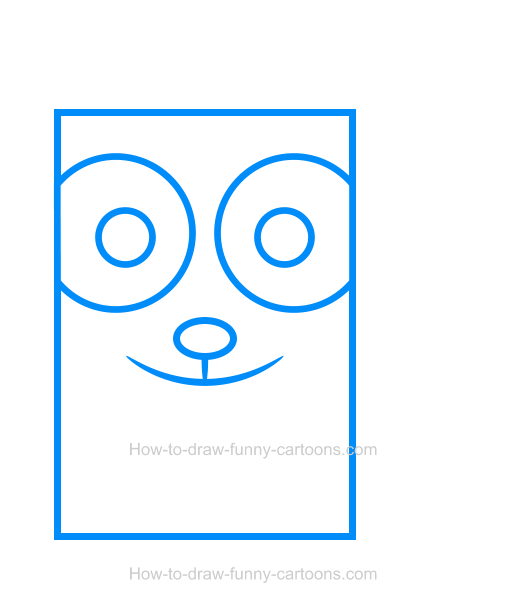 First, let's draw a large rectangle to represent the body and the head of the character. That's right. Both the head and the body are integrated into the same shape. 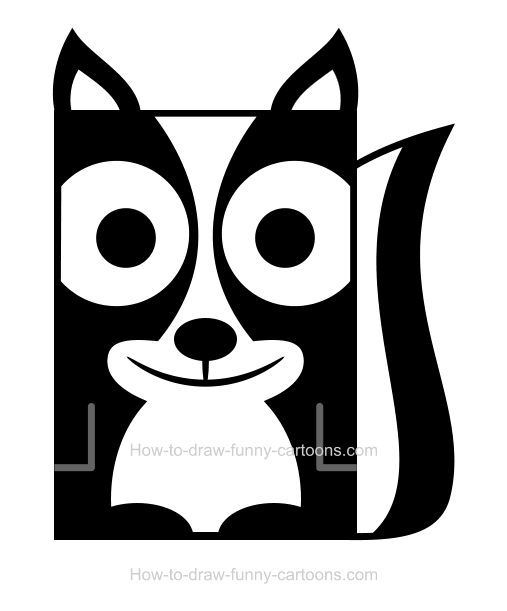 Next, using small and large circles, you can illustrate the eyes and the pupils of the cartoon skunk. Finally, create the nose using a large oval shape and draw the mouth using a simple curved line. Another small line can be used to join both the nose and the mouth. 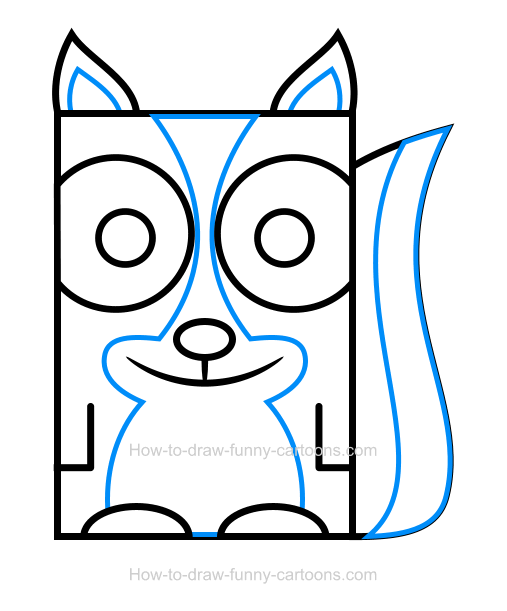 On top of the head of the character, draw two small ears made from curved lines as shown below. The tail is done with a long curved line. The hands are created from two small straight lines and the feet are done from oval shapes. Nice work. We are almost done. It's time to add more details inside the character to make it look like a skunk. Inside the ears, another shape that should be similar to the ears can be added to form a patch. On the tail, draw a long curved line in the middle to separate the white stripe from the black one. Complete this step by sketching a large circle on the stomach, a small oval shape around the mouth and two long curved lines between the eyes. All the shapes must be joined together to create a unique patch on the body and the head. Let's add colors (well, only one color ... black) to enhance this illustration even more and make sure that this character does look like a fun skunk. 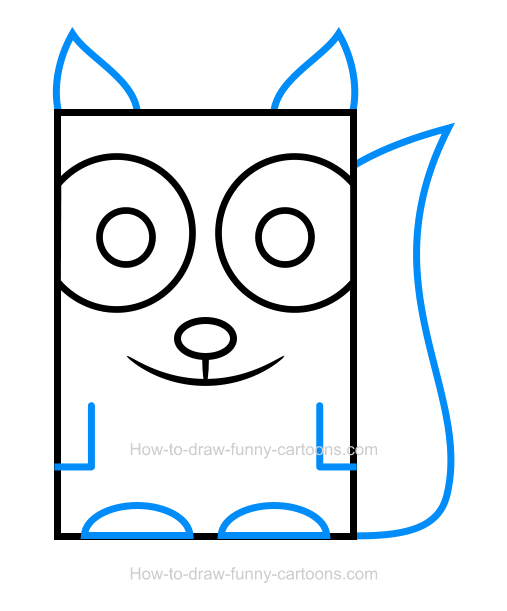 All parts of the cartoon animal must be black except for the eyes, the patches inside the ears, the long patch visible in front of the body and the tail. A small touch of grey is required to draw the hands of the animal.